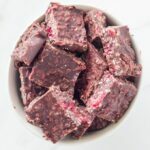 Raspberry coconut rough is a recipe you need to make now! Made with only 5 ingredients and takes no time to prepare! Lightly toast the shredded coconut in a small fry pan on medium heat for 5 minutes. To make the chocolate mixture, melt the coconut oil in a small saucepan on low heat. Once melted, remove from heat, add the sweetener, whisking briskly until well combined. Then add the cacao powder, stirring until well combined. Roughly chop the raspberries and place with the shredded coconut into the saucepan and stir through the chocolate mixture. Pour into a lined square baking tin (or spread evenly on lined baking tray) and place in the freezer for 30-60 minutes to set. Slice in desired pieces and serve. I recommend storing in the freezer to keep firm. If you use frozen raspberries, you need to thaw out first and remove the excess moisture, otherwise the recipe may not set properly.